One of the many ‘can’t-miss’ Branson events during the Autumn months is seeing the explosion of color throughout Branson and Northwest Arkansas, Table Rock Lake and the Ozark Mountains by taking a fall foliage tour. Whether you want to drive, bike, boat or hike, you’re sure to remember the picturesque landscapes cascading atop the hills and shorelines of Ozark Mountain country. There’s also some ideal places to stay during the fall months like America’s Best Campground, Chateau on the Lake, Crescent Hotel and Spa in Eureka Springs and many more (view all our Branson lodging members here). Regardless of how you take your Branson fall foliage tour, you will surely get all the beautiful fall pictures you could want. Table Rock Lake starting at Table Rock Dam/Chateau on the Lake – Begin at the dam and Lake area and through Kimberling City, Branson West & Cape Fair – This trip will take at least an hour by car winding through the hills south of Branson, along old Hwy 86 then onto Hwy 13 and north through the little towns that dot the western side of Table Rock Lake and Branson. Lake Taneycomo through Mount Branson, Forsyth and Rockaway Beach – Cross the Lake Taneycomo bridge and take a left. You’ll climb Mt. Branson and head into the roads east of town. Forsyth is the county seat and both it and Rockaway have plenty of beautiful views of the mountains and Lake Taneycomo. Eureka Springs Hiking, Biking and Tram Tours – Once you’re in Eureka Springs, its pretty much every direction you look. One of the most popular is the Eureka Springs Tram Tours ran by Joe GunnelsTours. Lake Taneycomo through Downtown Branson, Branson Landing and North Beach Park – Perfect for those wanting to get outside, the shoreline along downtown Branson provides you with nothing but 360 degree views. Dewey Short Visitor Center – On the south side of Table Rock Dam you’ll find the Dewey Short Visitor Center and its abundant shoreline trails and views. Table Rock Lake by Resort or Boat – Rent your own little spot on the shorelines of the lake, rent a boat or board the Showboat Branson Belle. Lake Taneycomo by Resort or Boat – Much like the scenic beauty of Table Rock, Lake Taneycomo, starting your tour at Table Rock Dam, is a sight to be seen by boat. And there are plenty of little resort, cabins and condos to rent. Dogwood Canyon’s Hiking, Biking, Camping, Tram, Fishing and More – Its quite simply, just beautiful at Dogwood Canyon this time of year. Why Branson, the Ozarks and Eureka Springs for your Fall Foliage Tours? If you’ve ever been, then you already know. Branson and Eureka Springs are ranked nationally for the top places to see the fall leaves change. In addition to the shear amount of viewing and photo opportunities you have, there’s also so many ways to actaully see it. Bring your own car, rent one, ride on a guided tour, bike your way around, hike or even take a train through the Ozark Mountains. 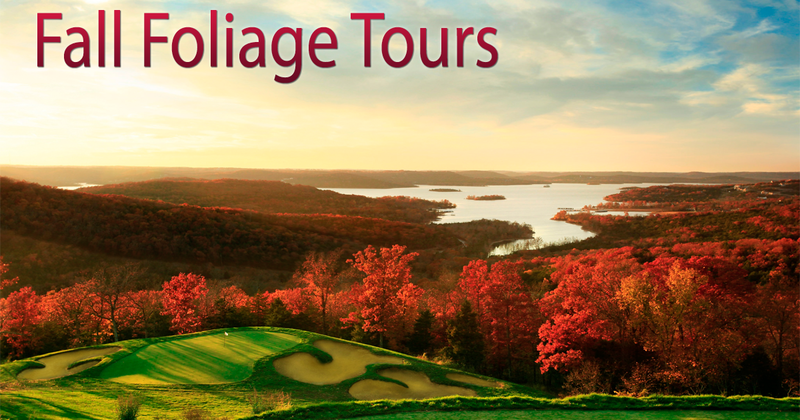 For the best viewing experience and to see the fall leaves at their peak, early to mid October is the best time to take your Branson fall foliage tour! So, give one of Branson receptives a call and let them take away the hassle of planning your fall vacation in Branson. Your fall foliage tour awaits!